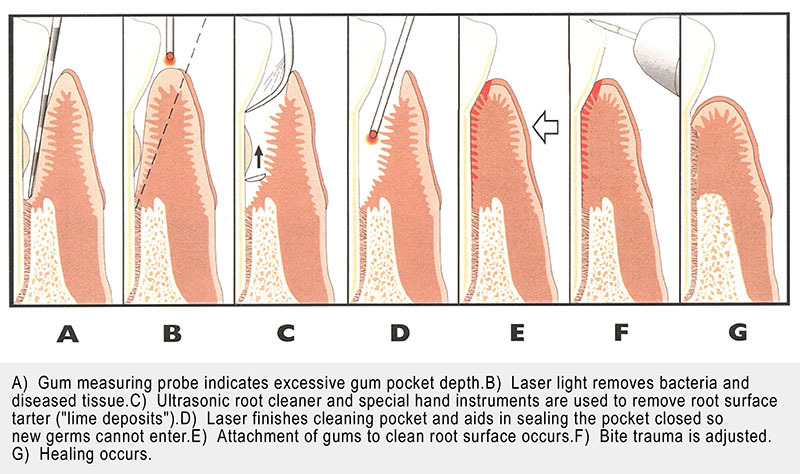 LANAP is a revolutionary new laser gum therapy that can offer many benefits for your periodontal health. LANAP stands for Laser Assisted New Attachment Procedure, which provides a gum treatment that eliminates the majority of the pain experienced during traditional treatments. Dr. Jon C. Bauman, our skilled dentist, will use the LANAP laser to remove the diseased tissue between your gums and teeth but leave the healthy tissue. LANAP lasers also help the treated area to regenerate as well. After the bacteria and tartar have been thoroughly removed from the gum pocket, Dr. Jon C. Bauman will seal the gum pocket in order to prevent further infection. The recovery time after LANAP treatment is much faster than with traditional techniques because there is no damage to the healthy tissue. After a procedure is complete, there is usually only very minimal pain experienced by the patient, and painkillers are often not necessary. LANAP can be completed in just two short visits, which allows for less time spent in the dental office and less time recovering. If you have any questions about LANAP laser therapy in Brighton, Colorado, we encourage you to contact our team at Riverdale Dental Center for more information. We look forward to caring for your smile!